Spoilt and tormented? Just say Tah | Stand, spray and deliver. Or could we dream of releasing the esteemed Pinot blanc for a drought-breaking victory snifter? 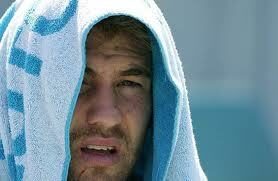 This is the hard knock life for the supporters of the NSW Waratahs. The devoted have become accustomed to the blended feeling of hopeful expectation and gut-wrenching concern over the years. It’s an icky emotion which is aggravated by performances which can be likened to sitting at a generously stacked manic depressive poker machine. Rocky needs to work on his hide'n'seek skills. We’ve witnessed the team go 12 rounds toe-to-toe with heavyweights such as the Crusaders before fronting up disjointed and drowsy the following week and being trampled by one of the 20 cent South African provinces in a siesta-inducing punt fest. I’ve seen aristocrats from the north shore sobbing into their chardonnays with such frustrated force that their monocles have fallen off. So what will Super Rugby 2012 bring for the spoilt and tormented in sky blue? If there’s been one constant with the club, it’s that they’ve never had any issues baiting the big names to roll up and have a run. And it’s no different this year with a couple of big fish from the Australian rugby scene landing in town to ply their trade. Well-travelled pack madman Rocky Elsom is here and he’s been given the captaincy. Except he’s out for the first 8 weeks. Another valuable addition to the payroll is backline Mr Fix-it Adam Ashley-Cooper. He’s left the exhilarating lifestyle of the ACT for Tah-land to beef up our depth and keep the hyphenated surname quota up to scratch. AAC and Berrick racing for parking spots. There’s also the underrated Sarel Pretorius who topped the tryscoring charts last year with South Africa’s breadline Cheetahs team and a homecoming for barrister backrower Dan Vickerman. On the other hand, there’s been a few who have had the temerity to depart our great rugby organisation. Seeing a ruck and maul without breakdown viking Phil Waugh will just look downright weird, and conjuring sparks in attack without Wallaby wonderkid Kurtley Beale will certainly be causing new coach Michael ‘Axle’ Foley a few sleepless nights. Sarel: where the f*ck did his leg go? The campaign commences with a curveball that has swung on a right angle. Playing the defending champions and detested rivals Queensland in a ‘home’ game at the characterless ANZ Stadium with a truckload of talent on the sidelines and an unproven captain would’ve added teeth-grinding to Foley’s already restless sleep patterns. Drew Mitchell, Lachie Turner and Berrick Barnes will join Vickerman and Elsom in making up one mighty sick bay, whilst veteran benchie Daniel Halangahu will take the role of captain in a combination of circumstances that will have the Tahs faithful scratching the noggin right up until the final hooter. An appropriately confusing way for the Super 15 to commence in bona fide Waratah style.